Recently Engaged Over The Holidays? Recently engaged over the holidays? Congratulations! The Ballroom at McKay would like to host your special day in a BIG way. 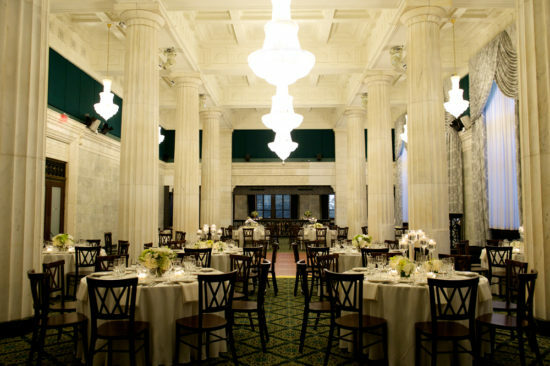 Think soaring twenty-six foot ceilings complete with twenty-four foot marble columns, original marble walls and detailing, and a state of the art lighting system that transcends the venue complete with bling thanks to chandeliers high above. Wood mahogany Venice chairs and linens in over 30 colors finish out the space, included with your rental. Our staff prides itself on hosting receptions and ceremonies tailored to meeting the needs of each couple and their guests. From creating unique floor plans to creative bar options and everything in between, we help our clients dream big. Don’t delay in scheduling a tour to view this amazing venue located in the heart of downtown Grand Rapids. We have prime 2019 dates including Friday and Saturdays in summer and fall!